People are usually grilling outside when there is sunshine. With temperatures rising after several cold months, the coming seasons will be perfect for businesses that are in grill cleaning. At The BBQ Cleaner, we provide a proven business opportunity in South Carolina that involves cleaning grills the professional way. You will own a unique barbeque cleaning system that is designed to remove all traces of carbon deposits, fat, and grease in hard to reach areas. If you are looking to start your own business, this is an opportunity you do not want to miss. When you work with us, we will be providing all the knowledge, supplies, training, and tools you need to start a successful business. You will also have the freedom to operate your business how you want. There are no restrictions and you can enjoy great earnings potential. The BBQ market in South Carolina is getting bigger by the day. This translates to a constantly growing customer base! Why Start a BBQ Cleaning Business in South Carolina? Weather Favorable for BBQ: South Carolina is known for having a pleasant continental climate. You can be sure that your business for BBQ grill and cleaning services will prosper in this state. Plenty of Potential Customers: BBQ grilling is very popular to many households in South Carolina. Many households have their very own grills. This gives you a chance to grow your BBQ grill and cleaning business in the area. Very Rare Competition: BBQ grill cleaning services is not a very competitive niche which means that you do not have to worry about others who might get in your way while establishing your business. Easily Grow Your Business: You do not have to worry about growing your business as soon as you invest in us. You can hire more staff and purchase more vehicles when needed. How Does The BBQ Cleaner Help You Get Started in South Carolina? Since our inception in 2009, we have over 180 operators all around the United States to date. As a global leader in the BBQ and grill cleaning industry, you can be sure we will help you unlock unlimited earning potential when it comes to the provision of grill cleaning services in South Carolina. Apart from all of these things included in our starter’s package, you can expect to have access to our on-going lifetime business support. You can count on us to help you grow your business successfully. 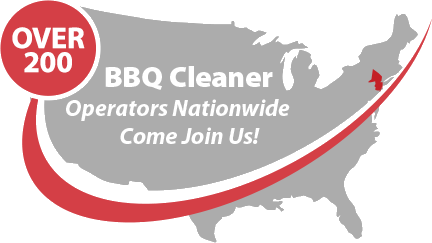 Talk to us today to find out more about this stellar BBQ cleaning business opportunity in South Carolina!